One of my favorite traditions that my husband's family does is a big fondue dinner for events like Halloween and New Year's Eve. Fondue is a very fun meal since everyone can make their own food, it encourages conversation around the dinner table, and it is delicious! I thought that it would be a fun thing to share from my family to yours, whether you use fondue to entertain friends and family, or as a fun meal “just because”, I hope that these easy to make recipes and dipping ideas will help to create a memorable meal! Cheese fondue is actually easier than most people think. You can use lots of types of cheeses, depending on what kind of flavor you want to create. I have included a recipe below for a basic cheddar cheese fondue since it is the most universal flavor and a good one to start on if this is your first fondue attempt. You can add lots of things to the cheese for different flavor, and cheddar is my favorite base because it takes to so many things. I like to add a little bit of salsa to my fondue cheese to get a little extra kick. Other things to consider adding would depend on your dipping foods-add apple or pear juice if you want to compliment your fruit dippers, or add avocado if you have a lot of veggies. You can also add a little bit of wine or beer, but be careful because oftentimes not all of the alcohol will cook out. Mix different cheeses, like Swiss and Gouda, together for another delicious fondue dip; I have also included a more complex multiple-cheese recipe below for the more adventurous! Dipper suggestions: apples, pears, blanched asparagus tips, celery, carrots, toasted bread cubes or thick crusty bread such as sourdough, and thick pita triangles (I prefer to toast the pita triangles as well). 1. In a medium saucepan over low heat, mix together milk, Worcestershire sauce, ground dry mustard, garlic and flour. Heat until almost boiling. 2. Gradually stir in Cheddar cheese. Continue heating until all the cheese has melted. 3. 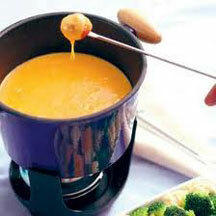 Keep the mixture warm and melted in a fondue dish. 1. Heat a ceramic fondue pot over medium-low heat. Once the pot is warm, rub the inside of the pot with the garlic clove. Pour the white wine and lemon juice into the pot. Mince the remainder of the garlic clove and add it to the pot. 2. Stir in the Gruyere cheese, Emmentaler cheese, Jarlsberg cheese, and smoked Gouda cheese, a handful at a time, stirring constantly until all the cheeses are melted and the sauce is smooth. 3. Whisk together the cornstarch, nutmeg, and balsamic vinegar, and stir into the cheese sauce. Continue to heat while stirring, until thick and smooth. 4. Keep fondue warm over low heat. For it to be a true meal, you have to have meat, right? Our family always has marinated chicken and steak to be dipped in hot oil (we usually use canola oil) and fried, as well as tempura batter to dip things in and fry. Make sure that your oil temperature doesn't get so hot that things only cook on the outside and not on the inside-this usually takes a little trial and error to get it just right. A good rule of thumb is that if a cube of bread browns in about 30 seconds, your oil is probably about perfect. You'll want to have your meats cut into bite sized pieces, and you can use any of your favorite marinades! I included a basic tempura batter recipe below, or most grocery stores have a pre-made tempura batter you can buy and just add water to. Make sure you keep the batter cold while serving it! Tempura batter adds a whole list of things you can then dip in the oil, which makes your meal more filling and complete. When you use the tempura, make sure that whatever you are dipping gets completely covered in the batter before it goes in the oil. Meat dipper suggestions: shrimp, scallops, and firm white fish such as halibut (use the tempura for the seafood), steak, and chicken. Tempura dipper suggestions: cubes of cheese, hot dog pieces (makes little corn dogs, these are my husband's favorite! ), hard veggies such as zucchini (these are also great with a little bit of cheese in them!). In a medium bowl, stir together the flour, salt, and baking soda. In a separate medium bowl, whisk the egg yolks together with the ice water. Then whisk the egg mixture into the flour mixture. 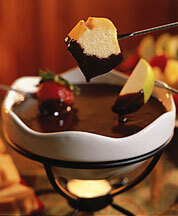 The best part of fondue is the delicious dessert! I included a basic, but very delicious, dark chocolate fondue recipe below. For added flavor, try adding orange (or other fruit flavored) liquor, cinnamon, or chopped nuts. You can also add caramel for a very decadent dipping chocolate. White chocolate can also be used, although I prefer the richer dark chocolate flavor. Be sure your chocolate stays warm while you are using it, because it will start to clump and harden if it cools too much. Since this is my favorite part of any fondue meal, I have LOTS of dipping suggestions for you to try, some traditional ones, and some you may not have tried before! Dipper suggestions: fruit (sliced bananas, strawberries, pineapple, pears, and apples), cookies (Vanilla Wafers, animal cookies, wafer thins, shortbread, and Oreos), marshmallows, gummy cinnamon bears, pretzels, angel food cake cubes, cheesecake bites, and, for the very adventurous, try dipping Ruffles potato chips! A candy store close to my home sells chocolate covered potato chips, and I am hooked! Make sure you get the sturdiest chips you can find so they don't break off in the chocolate. Enjoy! 1. In a medium saucepan whisk together the cocoa powder and sugar. Gradually pour in the evaporated milk and whisk well to make a paste. 2. Place the saucepan over a low heat and cook, stirring constantly, until simmering. Remove from the heat and whisk in the vanilla and chocolate and stir until the chocolate is melted. 3. The mixture will thicken as it cools slightly. Transfer chocolate to a fondue pot, and keep warm.